The story of Ethan Allen and the much-loved Green Mountain Boys of Vermont and their role in the American Revolution—the myth and the reality. A rare look at a corner of the Revolutionary War. 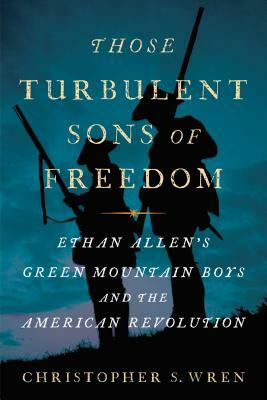 In Those Turbulent Sons of Freedom, Wren overturns the myth of Ethan Allen as a legendary hero of the American Revolution and a patriotic son of Vermont and offers a different portrait of Allen and his Green Mountain Boys. They were ruffians who joined the rush for cheap land on the northern frontier of the colonies in the years before the American Revolution. Allen did not serve in the Continental Army but he raced Benedict Arnold for the famous seizure of Britain’s Fort Ticonderoga. Allen and Arnold loathed each other. General George Washington, leery of Allen, refused to give him troops. In a botched attempt to capture Montreal against specific orders of the commanding American general, Allen was captured in 1775 and shipped to England to be hanged. Freed in 1778, he spent the rest of his time negotiating with the British but failing to bring Vermont back under British rule. Based on original archival research, this is a groundbreaking account of an important and little-known front of the Revolutionary War, of George Washington (and his good sense), and of a major American myth. Those Turbulent Sons of Freedom is an important contribution to the history of the American Revolution. Christopher S. Wren retired from The New York Times after nearly twenty-nine years as a reporter, foreign correspondent, and editor. He headed the Times’ news bureaus in Moscow, Cairo, Beijing, Ottawa, and Johannesburg; covered the United Nations; and reported from the former Soviet Union, Eastern Europe, the Balkans, the Middle East, China, Southeast Asia, Africa, South America, and Canada. He taught at Princeton University before coming to Dartmouth, where he is visiting professor in its Master of Arts in Liberal Studies program. He is the author of Those Turbulent Sons of Freedom. Wren explores the myths as well as the realities faced by this particularly hardy band of soldiers and their crucial contribution to the Revolutionary War. A worthy addition to the canon of works written about this fractious period in this country’s history.